We know. We’re late to the party. 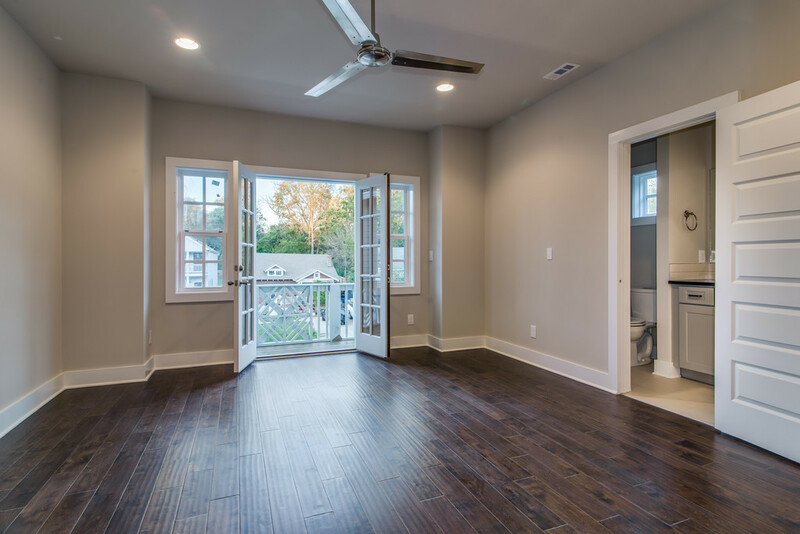 Better late than never, this project represents Bynum Design’s baptism into East Nashville. As our first new construction on the east side, it gave us occasion to get to know this sweet neighborhood, lined with the old houses that inspire us and the diversity we remember feeling excited about in 12South a decade ago. The Process: We built these two houses—situated side by side and separated by a firewall—for Prime Nashville, a developer that specializes in contemporary real estate. They reached out to us because they said they wanted to step up their design a little bit; we were up to the task. These homes are mirror images and staggered, so one has a bigger front yard and the other a bigger backyard. Throughout this post we’ve interspersed photos of both of the homes, which are certainly similar but also special in their own ways. The Kitchens. 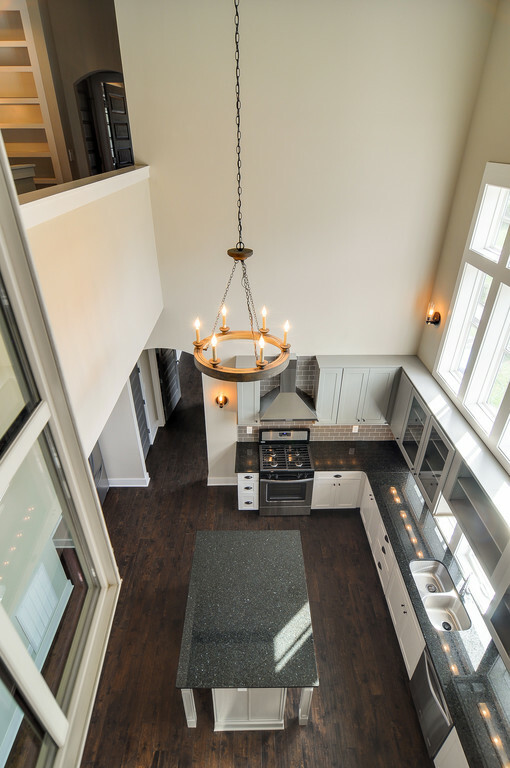 We are known for our sleek and stunning kitchens—as are, really, most designers who are worth their salt—but these have especially garnered a lot of attention with their sky-high ceilings and a wall of windows. Normally you just get one window over the sink, so you can imagine that a quantity of windows like this proved expensive and caused our developer some pain. (Worth every penny.) 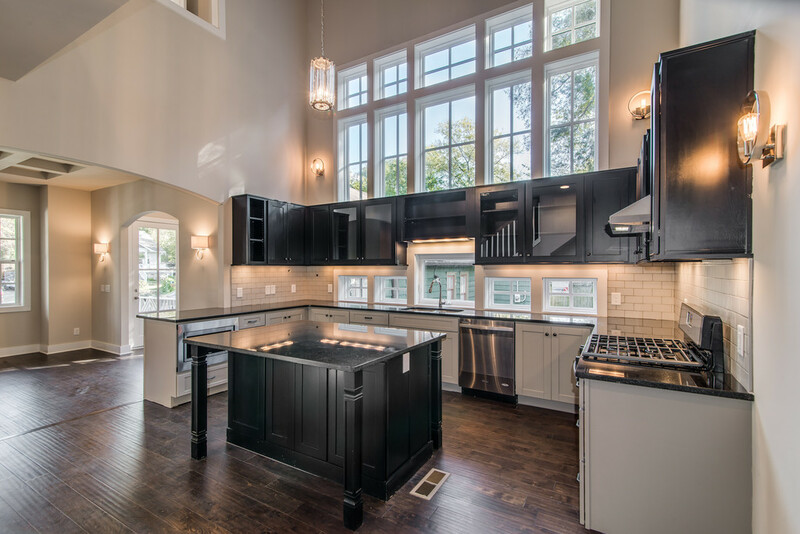 The only thing I regret about these kitchens is that we didn’t put in even more windows. 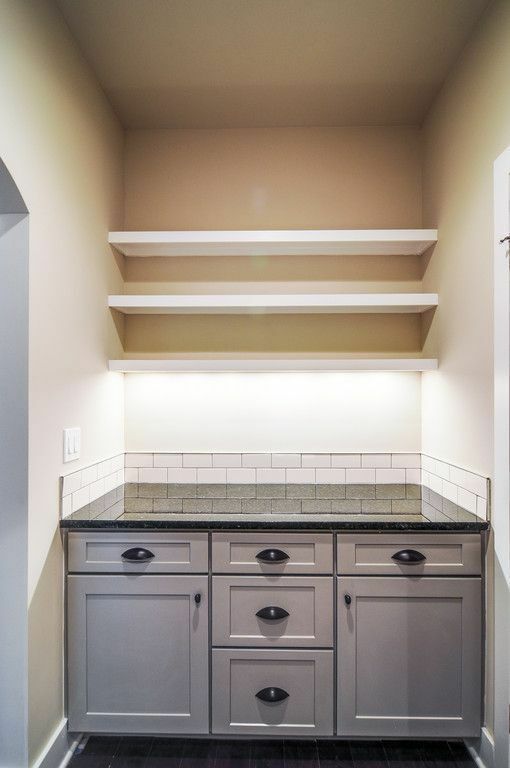 I wish they were behind the cabinets, too, so that they would have glass both in front of and behind the cabinets. The Ceilings. Budget constraints didn’t allow us to play with the ceilings as much as we would have liked to, but we were able to add beams upstairs and coffer a ceiling downstairs. Notice in the photo below that we also did a trio of skinny interior windows—another Bynum Design trademark. Urban Outdoor Spaces: If you read our recent blog post on designing outdoor living spaces, you know we are just as into exteriors as we are interiors. Both of these houses have a “party deck” upstairs on the front of the house, and a deck and an outdoor patio on the back. 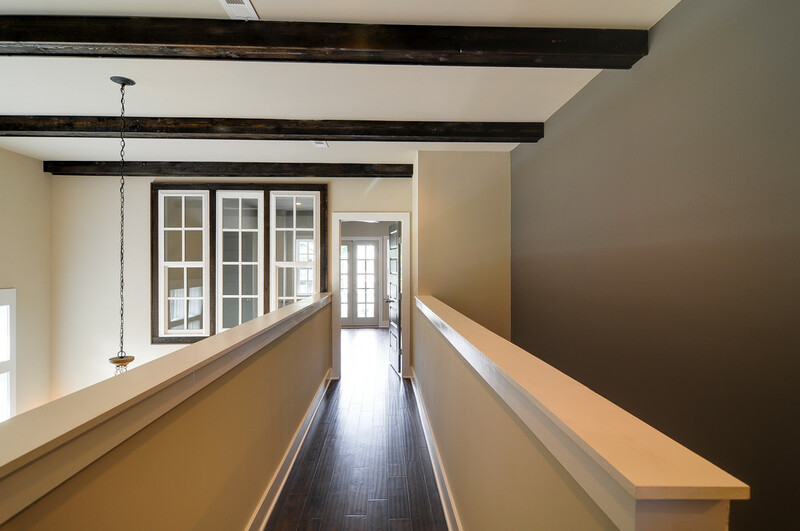 The Master Bedrooms: We were able to put double master bedrooms in each house—one upstairs and downstairs—and one of our favorite details is that the upstairs masters have coffee bars right off of them. A Narrow Lot: These houses had to be narrow to fit onto a 50-foot wide lot, which meant they needed to be built side by side with a firewall separating them. 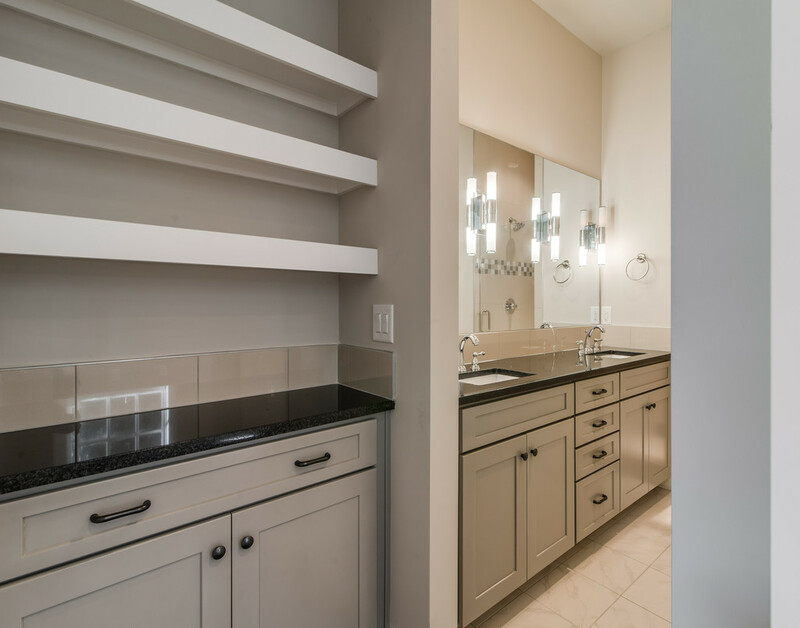 We had to design around that reality but also needed to give these spaces pizzazz and personality as soon as you walked in the door. A Small Footprint: Our biggest challenge was to hit a small square footage number—we were alloted 1,895 square feet each—and yet still lend these homes a lot of our drama. 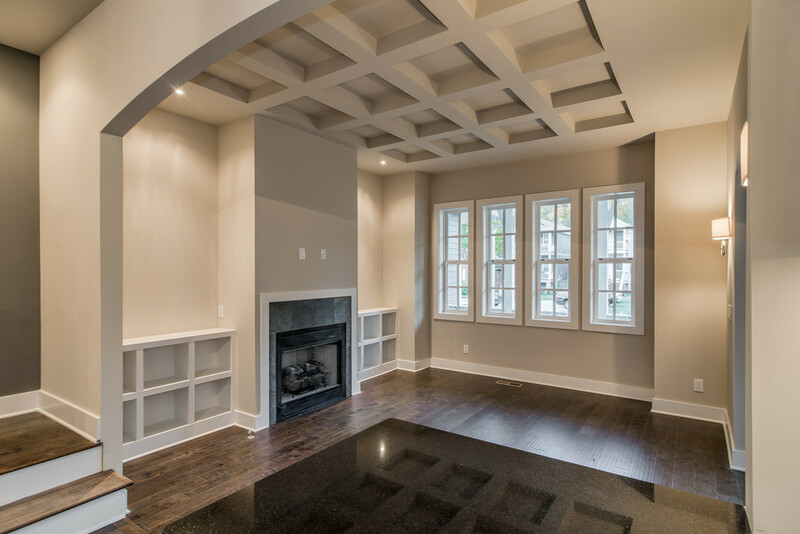 When you vault the ceilings in a space, it naturally subtracts square footage from the second floor, so it creates a puzzle: How do you make the footprint big enough on the first floor so that by the time you get all of that cut out on the second floor, you’re still at your target? 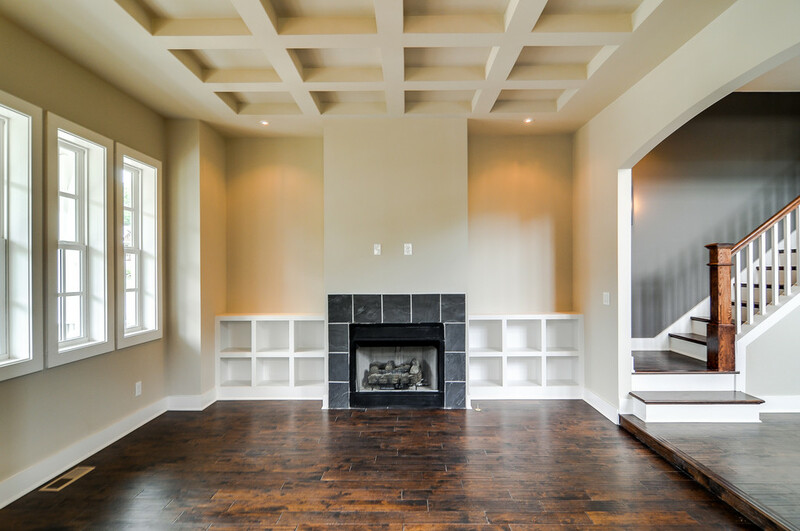 We want to know: What’s your favorite thing about our Sharpe homes? Our favorite part was starting the process of getting to know East Nashville. We’ll be back soon. This entry was posted in Story of a Home and tagged East Nashville, Prime Nashville, Sharpe Avenue, story of a home on November 18, 2014 by Ellen Barnes. Bynum Design will have a number of fun announcements to make in the coming months. For one thing, we just moved to a bigger, more beautiful and inspiring space (read all about it and see the photos here). 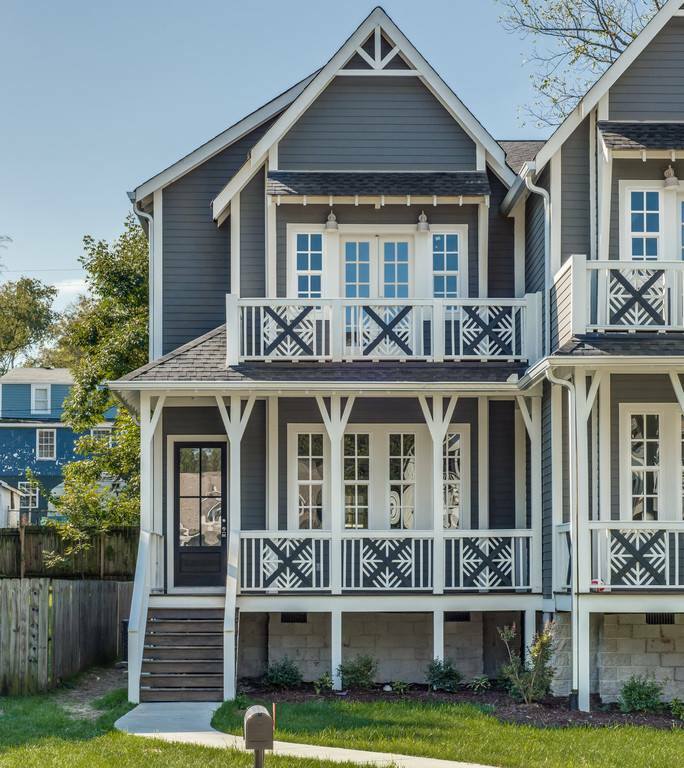 And here’s another great goings-on: We designed these cottages in Nashville’s Woodland-in-Waverly neighborhood. Called The Cottages of White Avenue, ground will soon be broken on this little eight-home community, which is—forgive our effusiveness—going to be so terribly cute we can hardly stand it. The developer who hired us is Jeff Miller of Jmiller Enterprises. Throughout you will find our renderings of this development, which we came up with in response to a number of challenges presented by the Metropolitan Historic Zoning Commission. Even though we had hoops to jump through, which caused some aggravation, the truth is that we sometimes do our best work when working within careful restrictions. Our challenge here was to play by the rules while staying true to our vision and to the drama for which we’re known. Besides dreaming up the plans for these, we were responsible for specifying all paint colors, finishes, lighting, landscaping, you name it. This project was perfect for us. 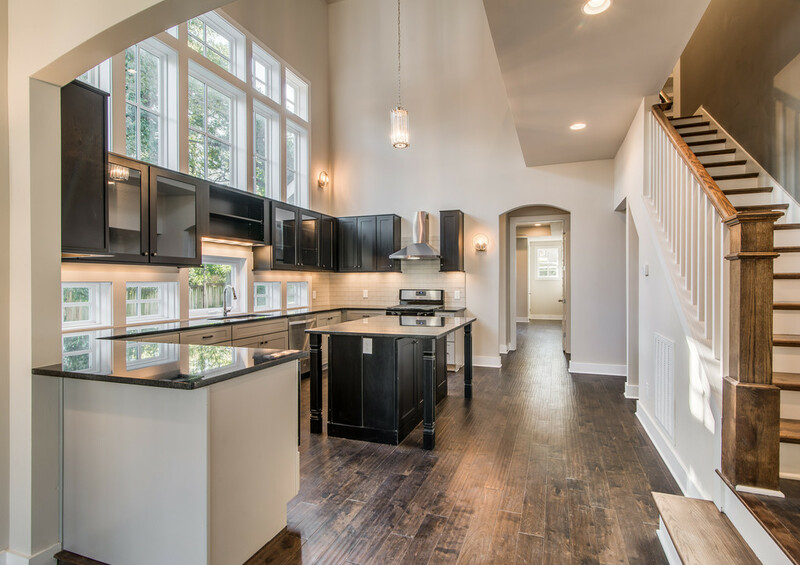 We are old house enthusiasts, so we were excited to try to give this new construction some of the character of the surrounding neighborhood. Criteria from the Commission meant we couldn’t use elements that didn’t exist anywhere else in the district, and we had to be mindful of maintaining historic proportions for windows. We also had to make the trim and windows different on each house. In other words, we needed to design eight homes that not only had something in common with the neighborhood but with one another, while still giving each one a personality of its own. These are different from most Bynum Design houses in that they’re simply not as tall; none of these have open, two-story spaces. These are one-and-a-half story houses, like the others in this old Nashville neighborhood. 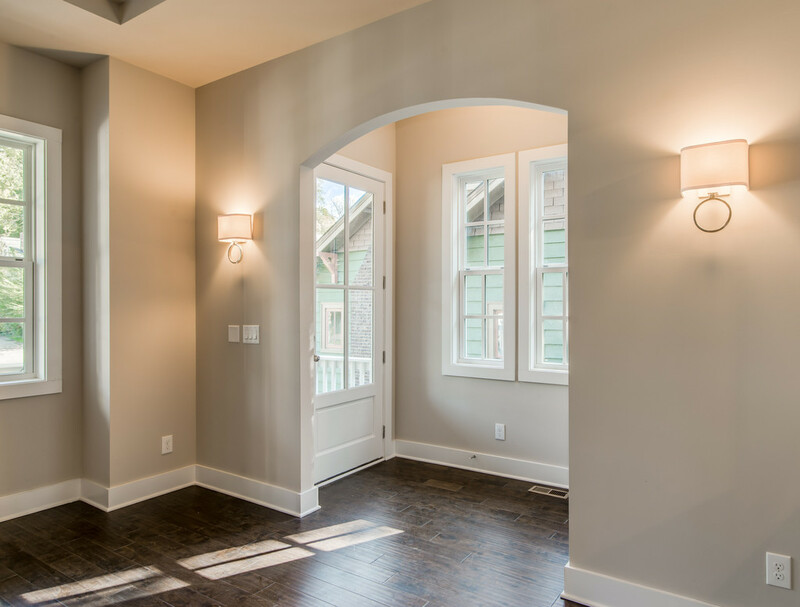 From the start we knew that these three-bedroom, 2½-bath homes would be smallish, ranging in size from 1,430 to 1,650 square feet. A couple of these have similar floor plans, though we’ve flipped the plans and changed rooflines and everything about the exteriors. 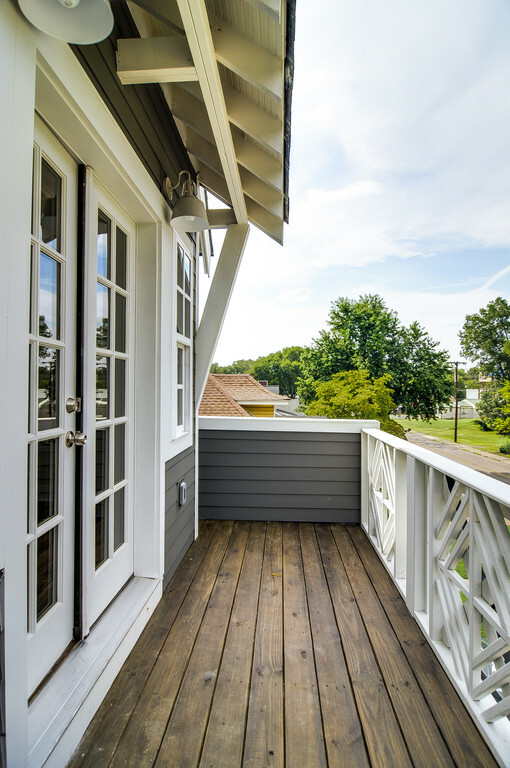 “Eight homes around a central courtyard will encourage people to talk to their neighbors, a sense of community,” Miller told The Tennessean in a recent article about all the new cottage communities popping up in Nashville. According to the piece by Bill Lewis, the cottages will be priced in the $400,000s (but don’t hold me to that)—a price point that we hope will give more people access to these homes. 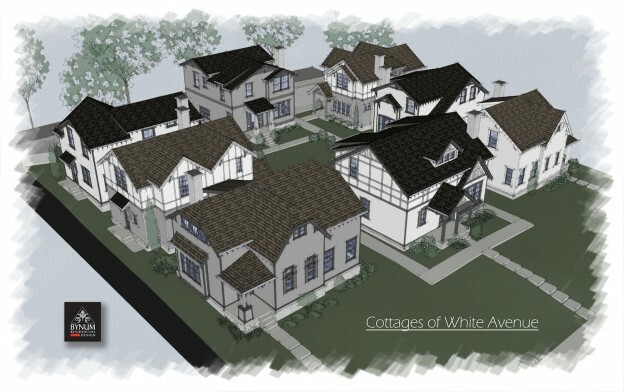 Besides having an idyllic common space in the center, the Cottages of White Avenue are designed to have great views of each other. Stay tuned for future posts about the Cottages. This entry was posted in News and tagged Cottages of White Avenue, Woodland in Waverly Nashville on November 13, 2014 by Ellen Barnes.